Heh, Chuck Norris (RM21.90) stole the show on our maiden visit to Huckleberry After Dark. The Hollywood action hero's name probably doesn't ring a bell with today's young ones but never mind, Let's Ta-co 'Bout It...for the dish of beef Barbacoa tacos, served with BBQ-root beer sauce, pico de gallo, fresh coriander and sour cream was a bona fide showstopper. Barbacao refers to the unique Mexican-Caribbean steam-smoke meat cooking technique which ensures meat so tender, it can be easily shredded or sliced into strips. We were thoroughly smitten by the soft tacos filled with that sweetish gamey pulled beef, accented with dollops of refreshing pico de gallo (chopped tomato, onion and coriander relish) and tantalising sour cream. Superbly yummlicious! After creating some buzz with its wide range of French-style baked goods (popular stuff like croissants and rustic breads are usually sold out post-lunch), Huckleberry made more waves when the outlet introduced its pun-tastic dinner menu. For a Wholly Guacamole opener, crunch time never tasted better than The House Guac (RM13.90). Now, a lot of stuff is made in-house from scratch so the guacamole was creamy yet partially chunky; a scrumptious blend of avocados, onion, tomatoes, cilantro, green chillies, jalapeño and lime juice. Served with two types of nacho chips, this starter was irresistibly addictive. Non-beef eaters may opt for Drop The Bass (RM19.90) as a viable alternative. Expect a tamer flavour profile from the chunks of battered fish in soft tacos. Rescue came in the form of some house slaw, jalapeño and pico de gallo so they should pass muster. Burger She Wrote was a plot to bring out the carnivore in us. Okay, Cheesus (RM19.90) sounded kinda blasphemous to some holier-than-thou folks but clearly, its main pun-ny intention was to elicit a smile or a chuckle. The towering cheeseburger stacked with 3 combo beef patty should lead dieters astray, thanks to its slathering of Huckleberry secret sauce, oozy American cheese, sliced tomato and fresh lettuce. We then slipped into The Beast Mode (RM26.90) to devour the hefty barbecued burger consisting of housemade brioche buns with 3 combo beef patty, housemade BBQ sauce, Barbacoa pulled beef, duck bacon, lettuce and fresh tomato. Accompanied by a generous helping of thick-cut fries, it was enough to leave hearty appetites happily replete. 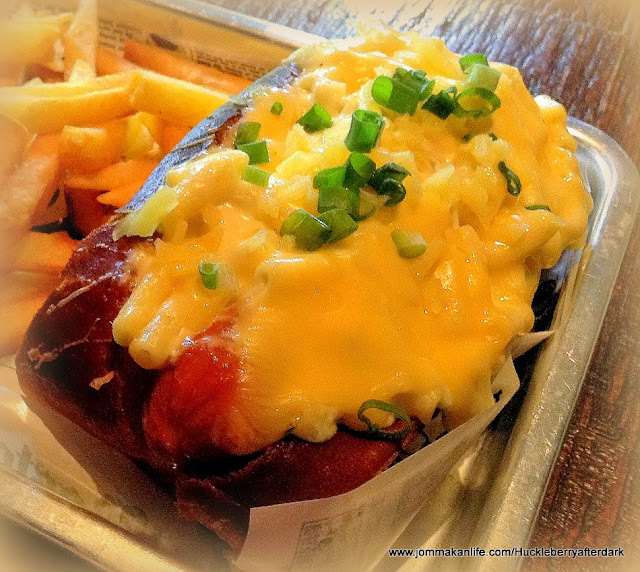 Two beloved American classics: macaroni & cheese and hot dog came together to form Return of the Mac (RM24.90). Dawg-gone it, such a simple masterstroke yet nobody had thought of it before?!! Gooey cheese fans would melt at the sight of mac & cheese blanketing a hot dog encased in a split long bun. Covered with even more melted American (cheddar) cheese and chopped fresh cilantro, this offering was wickedly indulgent to the max. The Bird Waffle (RM24.90) got our clucks of approval too. Amply supported by scrumptious pieces of buttermilk-fried chicken thigh, the 'waffle-wich dipped into hot honey sauce had us crowing with much delight. Competing for our attention was Lord of the Wings which came under the guise of K-Pop Frenzy (RM19.90-6 pcs, RM37.90-12 pcs). Most apt seeing how spicy gochujang sauce with black and white sesame seeds were employed to rustle up the Korean-style chicken wings. Our only grouse was the sweetish-zingy hot chicken appeared a tad over-fried. with tomato sauce, chicken sausage, mushroom, mozzarella and egg. Proclaimed as Another One Bites the Crust (RM32.90), its rustic albeit briny savouriness left us chomping at the bit for a tinge of sweetness to balance things up. The Mad Batter (RM19.90) came to the rescue just in time. We dug into the skillet of chocolate pudding laden with chocolate fondant, slightly scorched, melty housemade marshmallows, cookie crumbs and butter biscuits. A lush, richly satisfying offering to sweeten us up as the meal drew to a close. It was disconcerting to trifle with the beautiful mess of Rollie Pollie’s (RM16.90). Luckily the housemade churros smothered in Nutella and crushed Oreos were easier to eat than photograph. Expect to get down and dirty with this dessert but heck, food was meant to be fun sometimes so just go for it. Parched throats will find ample succour here as the extensive beverage list veers between handcrafted mocktails such as Maui Waui (RM9.90) and The Ultimate Slushie (RM9.90) to bottled craft beers. Say 'cheers' to a 10% discount off beers during Happy Hours from 5.30pm-8pm.